Barcelona : Ediciones Grijalbo, 1990. This is the 1990 Spanish edition of Talking God, published by Ediciones Grijalbo in Barcelona, Spain. In its series "Bestseller Grijalbo Oro," the Spanish publishing house Grijalbo also put out Spanish editions of The Dark Wind (Vendaval de tinieblas) and People of Darkness (El Pueblo de las Sombras). 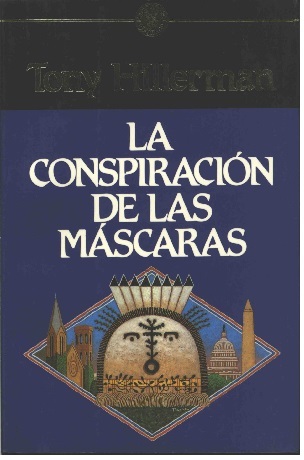 The text was translated into Spanish by Eduardo G. Murillo, with the title translated as "The Conspiracy of the Masks." The cover, designed by Xavier Castillo, reproduces Peter Thorpe's artwork from the dust jacket of the Harper & Row first edition featuring the pictorial representation of Talking God in the center with Washington D.C. buildings and monuments to either side. Binding: Paper covers with full color illustration. The spine is lettered vertically with the author's last name, the book title, and the Bestseller Oro logo. The front cover contains a fold-out section that provides a short biography of Hillerman and the back cover contains a fold-out section that lists the greatest hits released by Grijalbo.